It’s getting colder and colder in our part of the world now and the days will keep getting shorter for almost a month. That is why we need to find a way to bring some sunshine into our lives. The people from Gajbica brought a lot of sunshine in mine by sending me a delicious box of fruits and super foods and it was my job to bring some sunshine into the lives of my family by making them a healthy smoothie. The fruit box was full of delicious fruits, a lot of them tropical – pineapple, oranges, bananas etc. 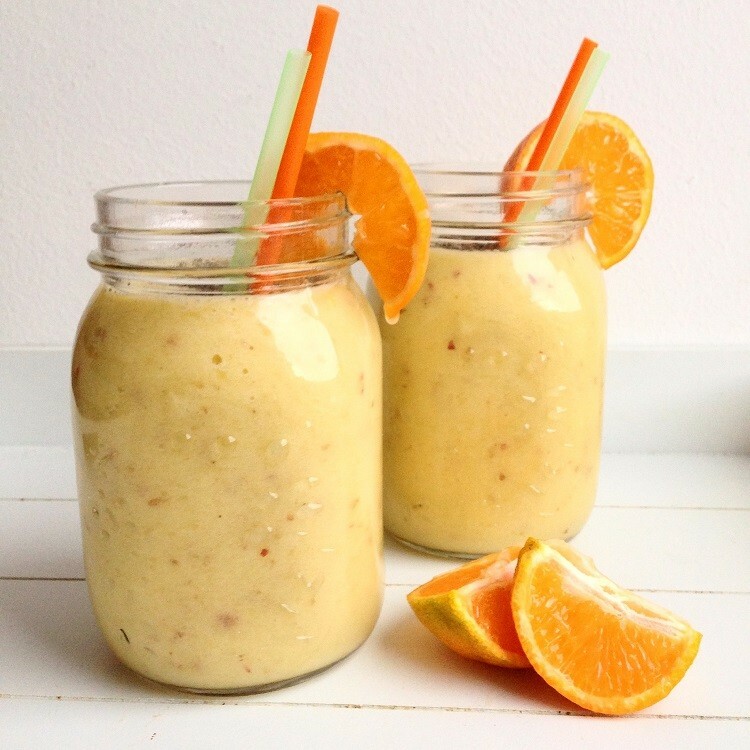 The only logical thing to do was therefore to make a delicious tropical smoothie, which makes for a great breakfast along with some chia seeds and granola or a perfect snack to replace those sandwiches we mostly reach for when we suddenly get hungry in the middle of the day. Making smoothies is really simple – the best way to make them is to first add the liquid in the smoothie maker, then green leaves if using any, and after that super foods, fresh fruits and frozen fruits. The basic rule is to use 1 cup of green leaves, 1 1/2 cup of fresh fruits and 1 cup liquid. Since 1 1/2 cup of fruit is a lot heavier that leafy greens, you will get a 1:2 ratio in flavor. I, however, decided to leave out the greens entirely this time and make a super fruit vitamin bomb. To make the smoothie, simply peel and slice all the fruits and mix them in your smoothie maker. Serve sprinkled with some chia seeds or granola.